Just got it. Very well packaged. Happy with purchase. En México estuve buscando como loca estos dibujos animados después de que mi papá se enteró de que existian, se lo regalé para Navidad y llegó justo el 24 por la mañana. Al día siguiente los vimos casi todos, son capitulos cortitos, con aventuras de los Beatles, desde ensayar en una casa embrujada hasta Paul siendo atrapado por un elefante de nombre Beethoven al ritmo de Roll over Beethoven. Amé que los capitulos lleven nombres de sus canciones, la parte del Sing Along es muy buena y nos tenia cantando sin inventarnos la letra. Muy recomendables para los fans. El único problema es que vienen completamente en inglés y sin subtitular, si eres fan de los Beatles pero no eres fan del inglés sin subtitulos pues puede que te pierdas de varios juegos de palabras y chistes pero igual vale la pena tenerlos como buen fan y coleccionista, sobre todo por que en México yo batallé para encontrarlos completos. Love It. Yeah, Yeah, YEAH! These are the memories. Of course as a kid the cartoons seemed a lot more exciting, but the music - oh the music! For something pulled from technology and archives from 50 years ago - wow. Too cool. Nice! 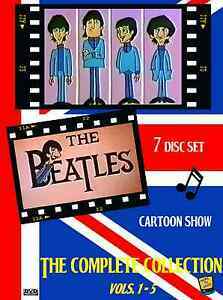 The entire original Beatles Cartoon series on DVD! This is really a great product. As the product information states, all of the shows are taken from the best archival footage available, so they are not completely perfect and pristine. However, they are of excellent quality and quite close enough to perfect! The picture and sound are quite good, and there is only the very occasional glitch for a moment. Nothing to quibble about. As far as the cartoons themselves, they are hilarious. They are extremely enjoyable and very silly and funny. 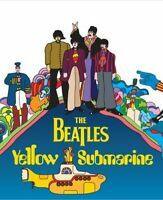 The Beatles are brought into all sorts of odd, unusual and bizarre situations filled with crazy and sometimes endearing characters. There are also many episodes where The Beatles visit castles and other locations with classic monsters and all sorts of variations on monsters and creepy creatures. The personalities they gave the fab four for this show are simply priceless. Silly, goofy, endearing, funny and often quite ridiculous. The playing of their songs usually is woven into the plot of each episode in amusing and creative ways, and often gets them out of trouble or into it. There really isn't another cartoon show like this one. It is unique not only in that it stars one of the most famous and popular musical groups of all time, but also in that it took a lighthearted and very silly and entertaining approach to placing those musicians into outrageous and comically slapstick situations and adventures - all in the style of the 1960's psychedelic and escapist themes. 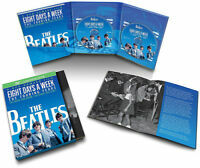 And throughout the series a huge portion of The Beatles musical catalog is showcased, with the original recordings, although they are often edited for time. Highly recommended! This was purchased as a Christmas gift. Very happy to have found it.